The family of San Francisco Bay-area resident Jared Tucker, who was in the area of Thursday's terror attack in Barcelona, has not heard from him since the car-ramming took place and is now desperately trying to locate him. Tucker and his wife Heidi Nunez have been vacationing in the Spanish coastal city. While Nunez has been in contact with family in the U.S., Tucker has not been heard from. 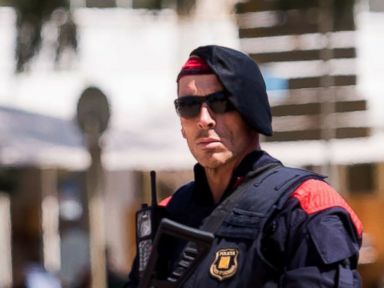 Tucker's brother-in-law, Kalani Kalnui, told ABC News, "I was in contact with [Nunez], he had to use the restroom, they were in a kiosk [to buy trinkets] in the middle of the sidewalk in the middle of Las Ramblas. He left, and seconds later she was pushed over into the kiosk and she was disoriented trying to find him. Police evacuated ... her from the area." Kalnui said of Nunez, "She was able to get out of the area with the friend they were staying with in Barcelona, who came and picked her up." Nunez returned to the area to try to track down her husband to see if any of the hospitals had any information about him, Kalnui said. She also visited the Red Cross to inquire if it had information about Tucker. It's been a heart-wrenching situation for Nunez, Kalnui said. "She's not able to find out information," he said. "[Officials] haven't posted anything as far as names who are injured or deceased." The U.S. State Department said one American was injured in the attack, although it did not identify the individual. "We can confirm one U.S. citizen suffered minor injuries," a State Department official said. "We are monitoring the situation closely and stand ready to provide consular assistance to any affected U.S. citizens."